Melbourne’s a world-famous city. It’s easy to see why – everyone loves quirky metropolises, with street art, beautiful buildings, a laid-back atmosphere yet still zillions of things to do. 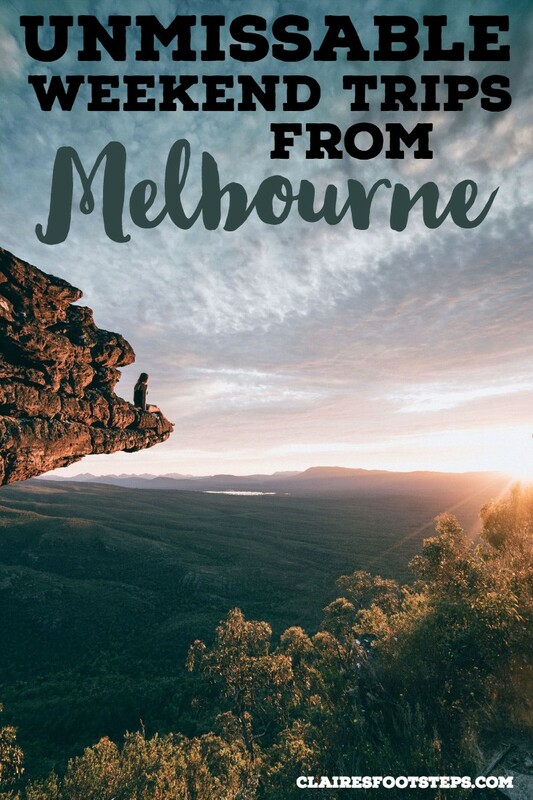 You could spend one week in Melbourne and never leave the city. But there’s much more in the state of Victoria than just Melbourne. And luckily, as the state is Australia’s second smallest, most are easily accessible on weekend trips from Melbourne! Now, while I have completed an entire road trip around Australia, I can’t pretend that I’ve seen the whole of Victoria – for such a small state, there’s a lot of things to do here. 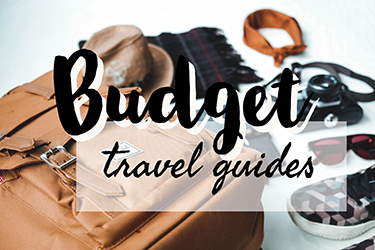 So when compiling the list, I’ve asked for some other travel bloggers for a bit of help. Some of them are Victorians (as in, people who live in Victoria, not people who were alive over 100 years ago in Britain 😉 ) and some are travellers like me. Together, we’ve created this ultimate list of where to go on the weekend from Melbourne. And of course, if you’re visiting the city and aren’t comitted to weekend trips, you can visit these spots any time – with the plus that they will probably be quieter! So let’s get started…. here’s the best weekend trips from Melbourne. 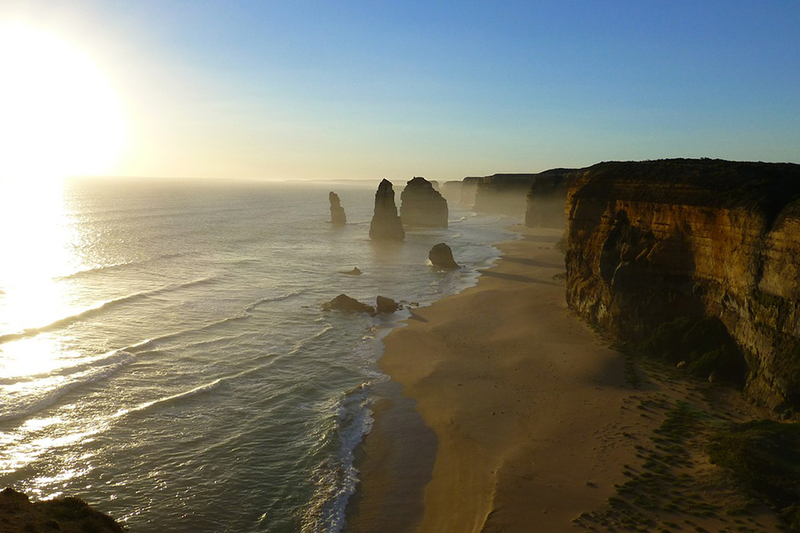 Spanning some 243 kilometres from Torquay in the east to Warnambool in the west, the Great Ocean Road is known as one of the world’s most scenic drives. The road is doable in a day trip from Melbourne, but it is better to take some time over two or three days to see its highlights. 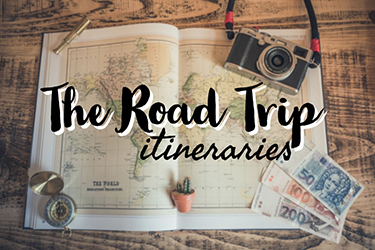 Driving along the road, you’ll get to see famous surfing beaches, a lighthouse that featured in the Aussia kid’s show Round the Twist, Cape Otway Rainforest (where there are lots of koalas!) and rock formations like the Twelve Apostles, London Arch and the Grotto. All are well worth checking out, and if it is summer surfing and sunbathing opportunities are available as well. Do be careful swimming, however – it is called the Shipwreck Coast, and for a good reason! Accommodation is available on different points of the road, including in Apollo Bay, Lorne and Warnambool. There are also plenty of eateries, bars and pubs in these areas. One of Australia’s most spectacular national parks, The Grampians is something that you have to see to be believed. Home to magical waterfalls, hidden woodlands and a dramatic peak – aptly named The Pinnacle – it’s like something out of a dinosaur movie. And if you learn a little about the Aboriginal dreaming stories of the area, you’ll think it even more so – they tell that it was created by Bunjil the Eagle, who could have been a megafauna residing in the region many years ago. On that note, Gariwerd (which is its Aboriginal name) has one of the best Indigenous centres in Australia. Brambuk tells the story of the natives of the land, but doesn’t sugarcoat what happened when European settlers arrived – which is very important for anyone in Australia to know. The Pinnacle hike takes the best of a day; you’ll be graced with an adventure-style clamber on the way up and spectacular views on the way down. If it’s a hot day, you’ll be able to have a dip in Venus Baths, as well! And the 2km walk around MacKenzie’s Falls is also well worth doing; as is the walk to the MacKenzie Falls lookout. There’s plenty of accommodation available in Halls Gap, as well as various free campsites scattered throughout the park. 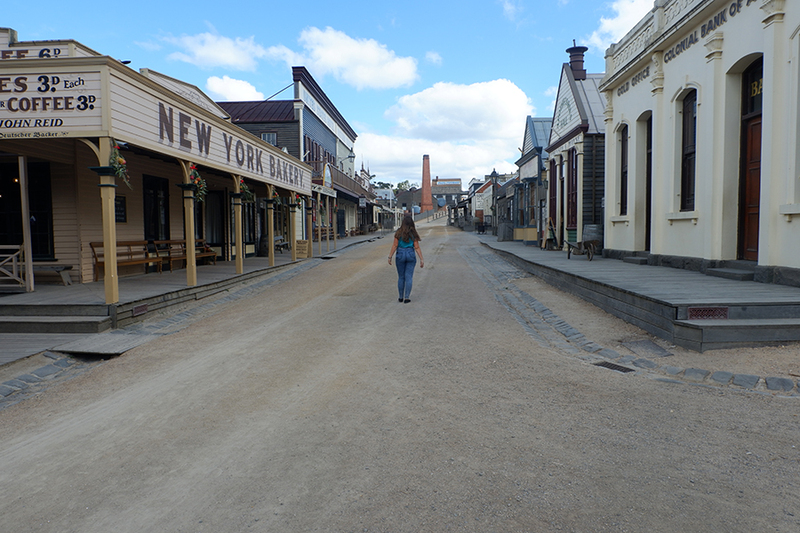 Famed for being the home of the largest gold rush, most weekend trippers head to Ballarat to check out the famous Sovereign Hill. It’s a really impressive living museum, where you are time warped back into the Gold Rush days. You’ll get the chance to eat old-style sweets, tour down the mines, pan for gold and even go back to school! It’s a great thing to do with kids, but is fun for adults as well. 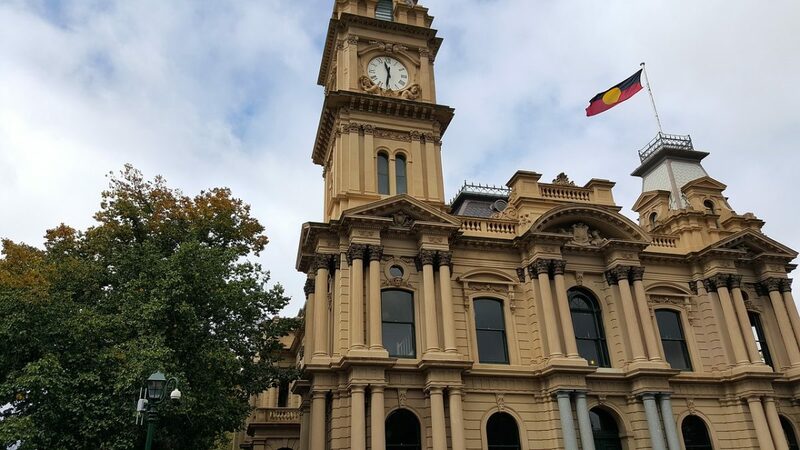 Other attractions of Ballarat include Lydiard Street, where there are lots of beautiful old buildings which reflect the city’s past – take a peek inside Craig’s hotel in particular, which has accommodated various notable figures throughout the years. Sturt Street is home to various statues depicting Ballarat’s history. There’s also a pretty lake – Wendouree – and my personal favourite, busts of the Prime Minister’s heads in the Botanical Gardens. There are plenty of eating and drinking options in Ballarat, and lots of places to stay in the city. At the southernmost tip of mainland Australia, Wilson’s Promontory National Park is a fantastic weekend trip from Melbourne; perfect for those who fancy heading to a beach that’s not St Kilda. It’s a place wher dense forest meets golden sands, and then blue sea, and is a great place for hiking, sunbathing and swimming (although be careful, the waters here can be dangerous!). It’s also a really quiet national park, meaning that you may well have it almost to yourself. 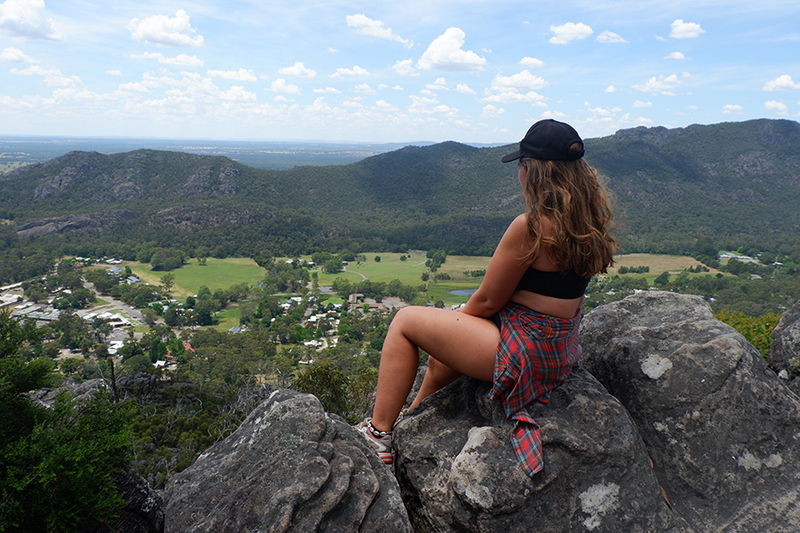 Highlights include hiking to the top of Mount Oberon and picnicking at the summit, getting your squeak on at Squeaky Beach (you’ll see what i mean when you walk across the sand!) and seeing the world’s most southern mangroves. 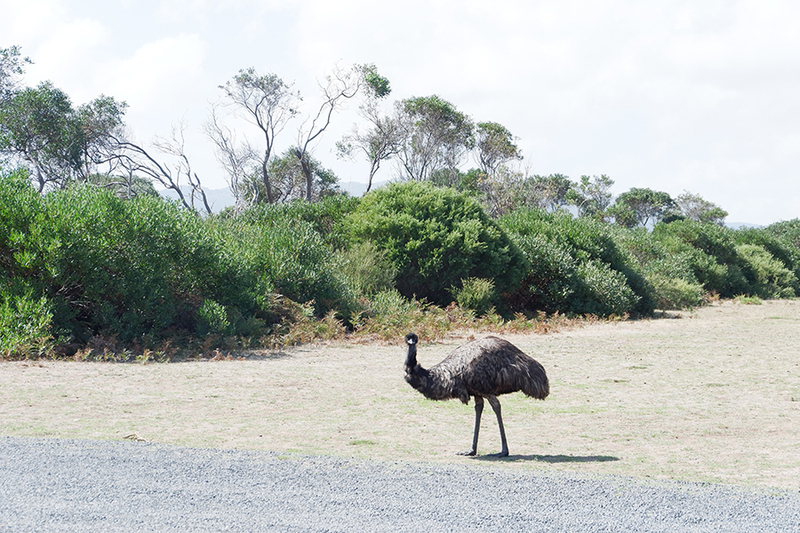 Wilson’s Prom is also home to a variety of wildlife, including emus, kangaroos, and lots of snakes – make sure you watch where you’re putting your feet! Camping is available at Tidal River, or a variety of places outside of the park. Check out hotels and guesthouses here. How to get there: Car is the best way, but plenty of tour buses go to Phillip Island too. Perfect for: Everyone! Families, couples, backpackers – there is something for everyone here. 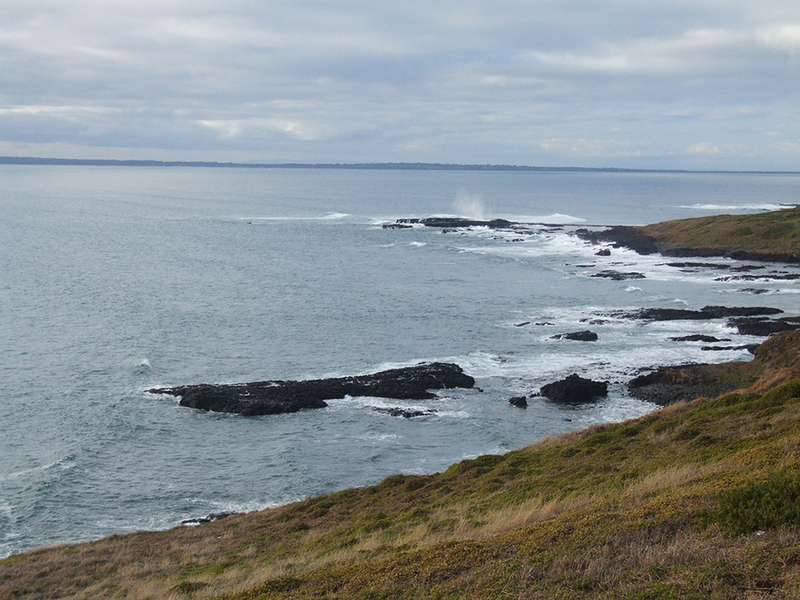 Located a 2-hour drive from the Melbourne CBD, Phillip Island is perfect for a weekend away. With it’s gorgeous beaches, wineries and good food, there is something for everyone in Phillip Island. For those that love outdoor activities there is plenty for you to do here. Hire a bike and take one of the bike trails such as the 18 kms Cowes to Rhyll or the 32 kms Bass Coast Rail Trail. Along these trails you will be rewarded with some fantastic views of the stunning Phillip Island beaches. Kayaking is another great activity for exploring the coastline. If you visit Phillip Island in the warmer months, then definitely spend some time on the gorgeous beaches here. Some of the best swimming beaches can be found on the northern side of the island such as Shelly Beach, Cat Bay Beach, Flynns Reef, Ventnor Beach, Anchorage Beach, Red Rocks Beach and Cowes Beach. Please note that many of these beaches are not patrolled so please consider this before entering the water. Surfing is also pretty popular on Phillip Island. Sports fans won’t b able to go past a visit to the Phillip Island Circuit. This is where they hold massive motorsport events each year such as the MotoGp, Superbike World Championships and the V8s. You can visit the display centre or even take a lap around the circuit. If you bring the kids be sure to stop off at A Maze’N Things where you can work together to solve a range of puzzles and be amazed at various illusions. There is also mini golf and high ropes here too. Lastly don’t return to Melbourne without stopping by Panny’s Chocolate Factory for some delicious chocolate tasting. How to get there: You are best to drive, however you can get the Vline train to Geelong and then get on a bus from there. However, getting around would be much better if you are driving. Perfect for: Everyone! The Bellarine Peninsula has something for everyone. The Bellarine Peninsula is an easy 90 min drive from Melbourne heading south west on the Princes Highway. Your gateway to the Bellarine Peninsula is Geelong, not only famous for their footy team but Victoria’s second largest city located on the coast. The Bellarine Peninsula is famous for its cool climate wines particularly popular and good are the Zinfandel and shiraz and merlots. 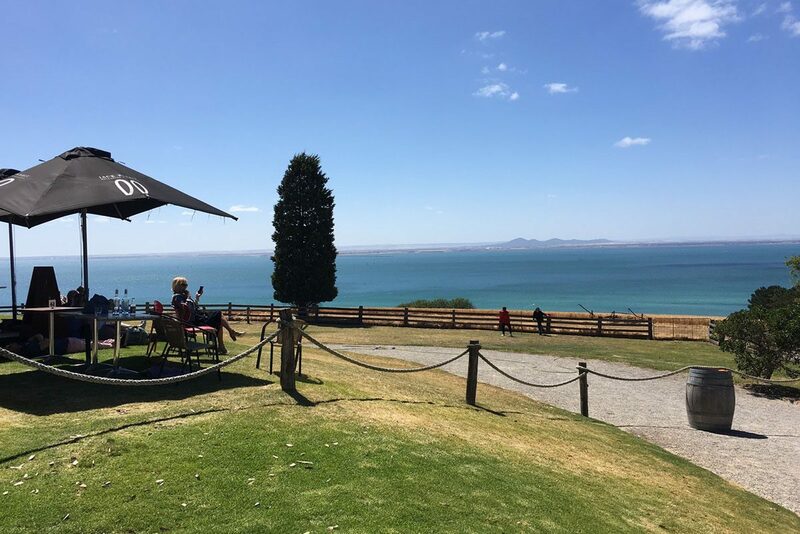 Many have cafes or restaurants attached, I strongly recommend Jack Rabbit Winery with there sweeping views over Port Phillip Bay and on a good day you can see the Melbourne skyline. Bellarine Peninsula is surrounded by amazing beaches. I grew up visiting Queenscliff on the Bellarine Peninsula every Christmas holidays with my family. It definitely holds a special place in my heart. 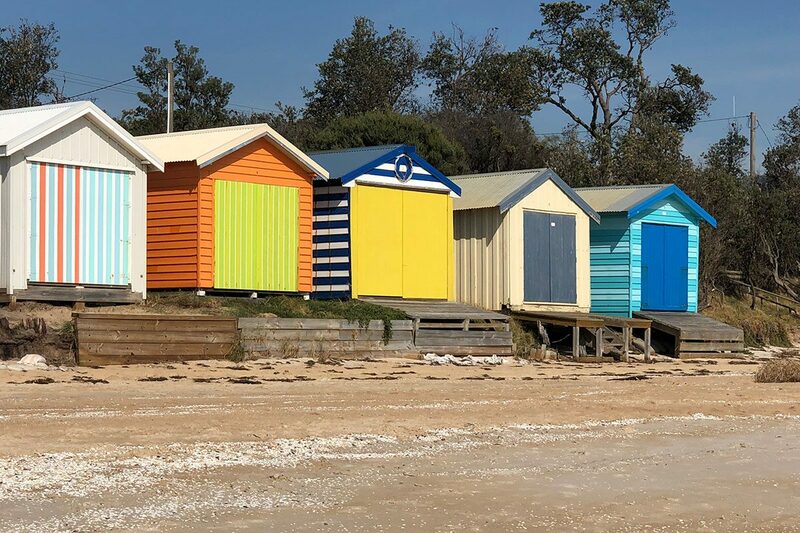 Point Lonsdale, Portalington, St Leonards, Swan Bay, Ocean Grove and Barwon Heads are only a few of the amazing beaches and these sleepy seaside towns (not so much anymore) also increase tenfold in numbers during the summer Christmas break. Being only a short drive from Melbourne these towns are popular for holiday houses for Melbournians wishing to escape the hustle and bustle of city life on weekends. There are plenty of places to explore on the Bellarine Peninsula and each town has a farmers market each weekend with local produce and crafts supplied by local residents. If you are on the Bellarine Peninsula on a weekend, look out for one of the amazing weekend markets, I’m sure you’ll find it fun. For kids you’ll find Victoria’s only water park, Adventure Park located between Geelong and Queenscliff. There is also mini golf nearby and various outdoor playgrounds and of course, if the weather is great, the beach is perfect for surfing lessons and swimming. 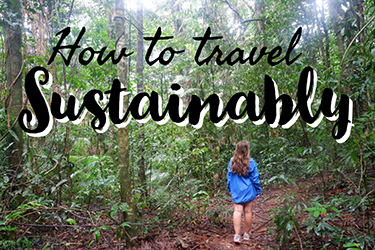 How to Get There: By car or train it is just short of a 2 hour journey (make sure you catch an express train! ), both are equally pretty journeys past the Macedon Ranges. Having a car will give you more flexibility to visit outlying places, but the train means you can sample more local produce! Journey almost directly north of Melbourne to the states most central point, the historic goldfields City of Bendigo. One of Australia’s oldest cities with a rich past – in fact at one point in the 19th century gold rush it was considered to be the richest city in the world! Today there is still gold mining, but on a much smaller scale. It is a hub city now for country Victoria commerce and tourism. The first thing you should do is delve into the city’s historic past. You can take a tour through Central Deborah Gold Mine – not for the claustrophobic though as you head 228m underground in a cage! Then catch one of the historic talking trams of Bendigo – as iconic as the city itself! Maybe not the quickest way to get around town but a ride on Australia’s oldest tram network is a must, and you will get a great history lesson while you’re at it. The city has a rich Chinese past thanks to the gold rush era. Exploring the Dai Gum San (“Big Gold Mountain”) district you will find the Golden Dragon Museum – home to Sun Loong, the world’s longest imperial dragon who only makes an appearance once a year for the Bendigo Easter Festival. You can also explore the Yi Yuan Gardens, Kuan Yin Temple, and the ever-popular Bendigo Joss House Temple. (Note you can tram between the gold mine and the Joss House using the free parking at either of these sites). A burgeoning industry now for the region is around fresh produce – amazing wine (the region, including Heathcote now has 55 wine produces!) as well as up and coming craft breweries. There are many restaurants, bakeries and cafes all over the city serving only the best from local farmers, including award-winning The Woodhouse. If you don’t have a car to drive between all these stops, there are many historic pubs in central Bendigo to sample local grapes and hops, or join the weekly Food Fossicking Tour that will transport you between stops using a pairing menu. Travelling with children, you might be surprised to learn the city has over 100 playgrounds! There’s a superb play space in the city’s central Hargreaves Mall, Fun Loong. Lake Weeroona is another popular outdoor play space, and the perfect rainy day escape is the Discovery Science & Technology centre (conveniently opposite the railway station) – home to the southern hemispheres tallest vertical slide! The Dandenong Ranges make the perfect weekend trip from Melbourne for those who want to get out of the big city and out into nature. Spoiled with choice, you can either fill your days with hikes, walks and exploring the local towns, or rent a cabin and relax and enjoy the peace and quiet. One of the most popular things to do if you are visiting the Dandenong ranges is to take a ride on Puffing Billy is Victoria’s famous steam train which runs from Belgrave to Gembrook through the winding forests and gullies. Stop off at Lakeside where you can have a BBQ or enjoy a picnic on the lake. There is even a pool to cool of in during the Summer. If you are up for it, head to the 1000 Steps Memorial Walk, one of the busiest walks in the East of Melbourne. This trail was built to commemorate fallen soldiers at Kokoda and is indeed 1000 steps so come prepared. For those looking for an easy day out, visit and explore the stunning Alfred Nicholas Memorial gardens where you can view a variety of native birds and exotic trees. Walk around, or picnic by the lake with a view. There are many other little towns to explore where you can find cafes, restaurants, and markets. There really is something for everyone in the Dandenong Ranges. 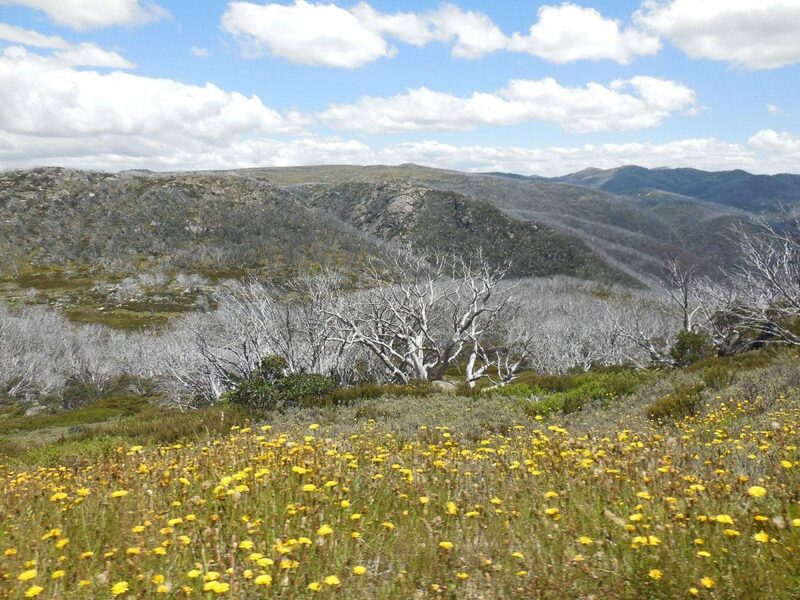 Distance from Melbourne: Lake Mountain is approximately 2 hours and 118km from Melbourne’s CBD. How to get there: Driving (along Eastlink then the Maroondah Highway, then the Marysville Road) is the easiest way to get there. However, there is a bus from Southern Cross Station and Lilydale Station by McKenzies to Marysville. From Marysville there is a shuttle bus to the Lake Mountain resort. 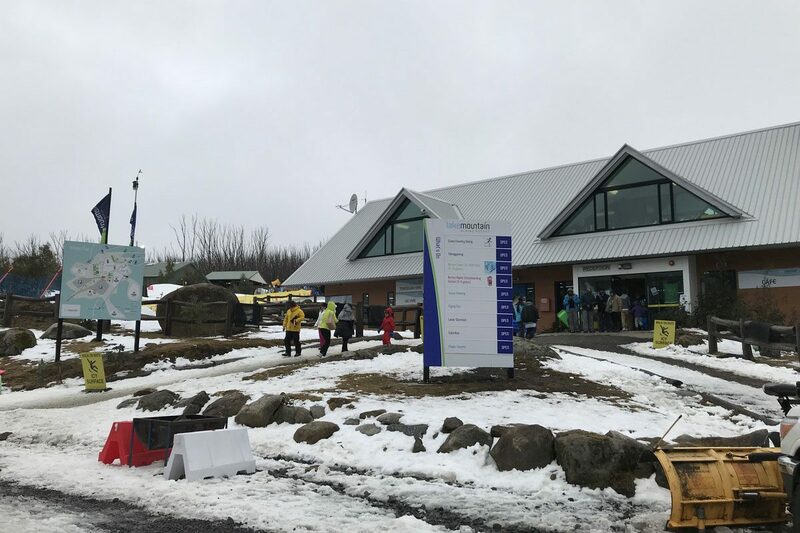 Perfect for: Lake Mountain Alpine Resort is great for families but also anyone else who wants a quick and easy visit to see some snow – especially without all the usual gear. Lake Mountain Alpine Resort and Mount Donna Buang are two options for seeing some snow on a weekend trip from Melbourne. While Donna Buang is a little closer, the Lake Mountain Alpine Resort has two great advantages: it has snow making machines so that there is a guarantee of some snow and it’s possible to rent almost anything needed once there. These two things makes trips to Lake Mountain an easy and fun weekend trip from Melbourne. The snow maker machines are set up on the main two toboggan runs at Lake Mountain so there’s always some action to be had. The hills and mountains close to Melbourne aren’t high enough for constant snow all winter. After a two hour drive to see some snow, it’s good to know there’s actually going to be some! Those toboggan runs aren’t that big but they are a lot of fun. For most people, the toboggan runs are the star attraction so they can get busy but that doesn’t ruin the fun. There are no downhill ski runs but there are several cross-country skiing tracks. Have no equipment? No problem! Lake Mountain has an equipment rental store where just about anything needed can be rented. This includes toboggans, skis, stocks, ski boots, ski pants, jackets, gloves, hats and goggles for most sizes from small kids to big adults. The rental fees can add up but it does make it possible to just want to jump in the car and go without worrying about frostbite. 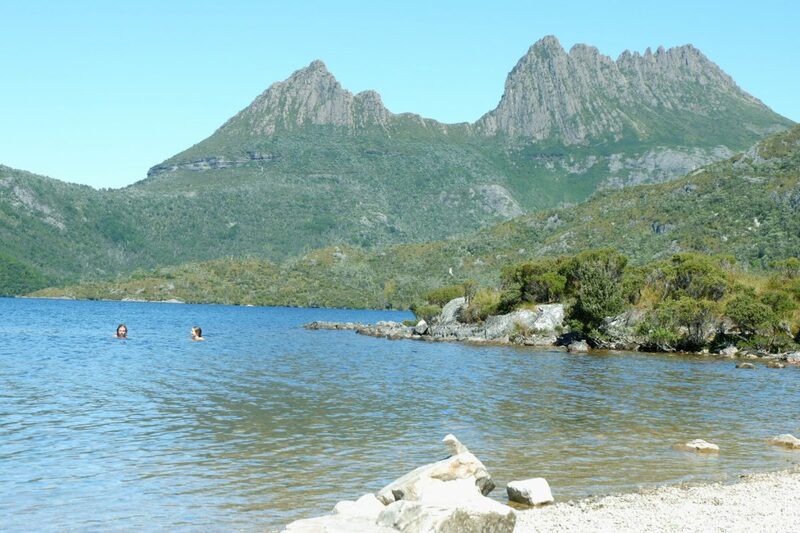 Snow chains or a 4WD are not required to get up to the top of Lake Mountain. However, the road can get icy and need to be closed temporarily until the road is graded unless cars have chains or a 4WD so they can help. For a weekend trip, stay overnight in Marysville. There are a few accommodation options and it’s a quick drive to the snow from here. There are activities in the summer as well when the area is perfect for hiking and mountain biking but winter time in the snow is best. How to get there: Most people will travel to Daylesford by car. Its an easy drive and very scenic. You can also catch the train from Melbourne to Ballarat and it connects with a bus from there. This takes around 3 hours. 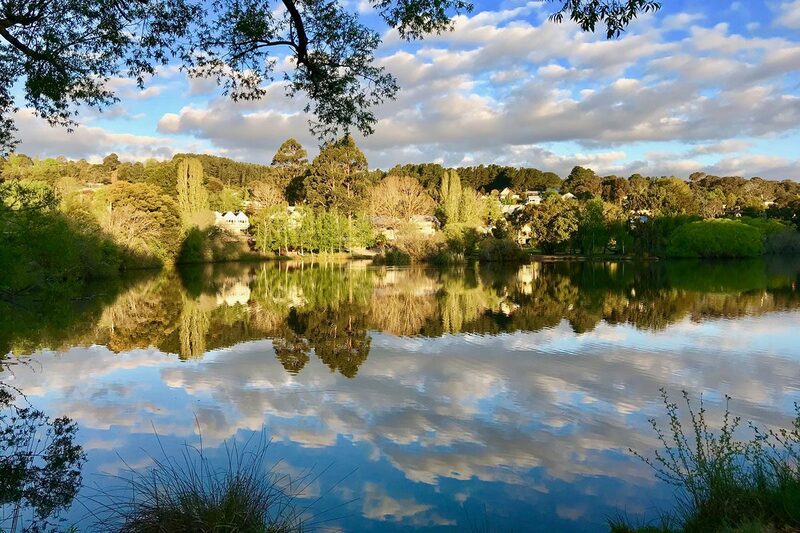 Daylesford is a quaint country town that is known as foodie heaven with a number of award-winning restaurants and providors, in particularly the famous Lake House restaurant. Local farms and growing conditions make for an abundance of excellent produce and hence a thriving cafe community. It also has a number of highly regarded art galleries and some excellent shopping. The lake itself is quite impressive and beautiful to walk around with a huge number of duck, goose and swan families running wild. 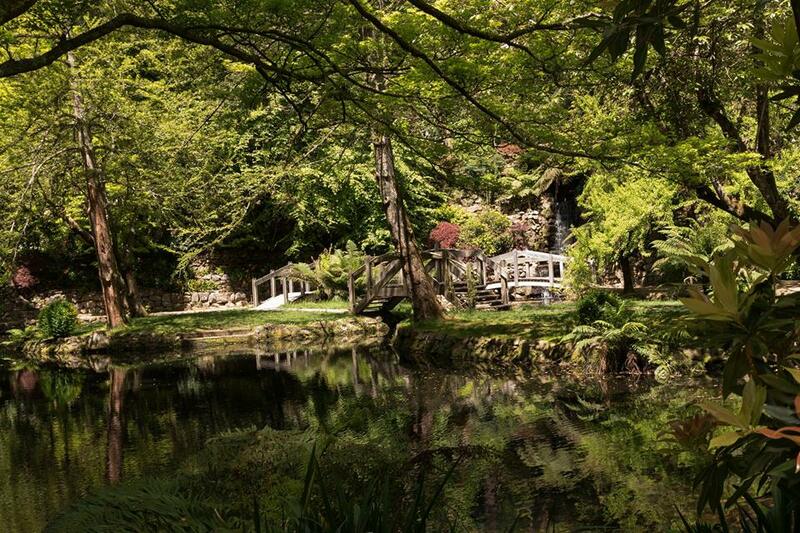 Daylesford is also in ‘spa country’ with an underground network of hot springs that are known for its healing properties and there are several excellent spas in neighboring Hepburn Springs. The tiny town of Trentham is also just 10 minutes away and is home to Victoria’s largest waterfalls at Trentham Falls. Whilst Daylesford is known as being a fairly upmarket destination it does have a wide range of accommodation and activities that suit all budgets and there is a lot to do regardless of the weather on the day. How to get there: Travel by car or alternatively take a train to Warrnambool from Melbourne then catch a bus to Port Fairy. Public transport times are limited. A visit to Port Fairy is a great way to escape Melbourne for the weekend. A historic beach side town that has a great range of activities, shops and restaurants to enjoy. 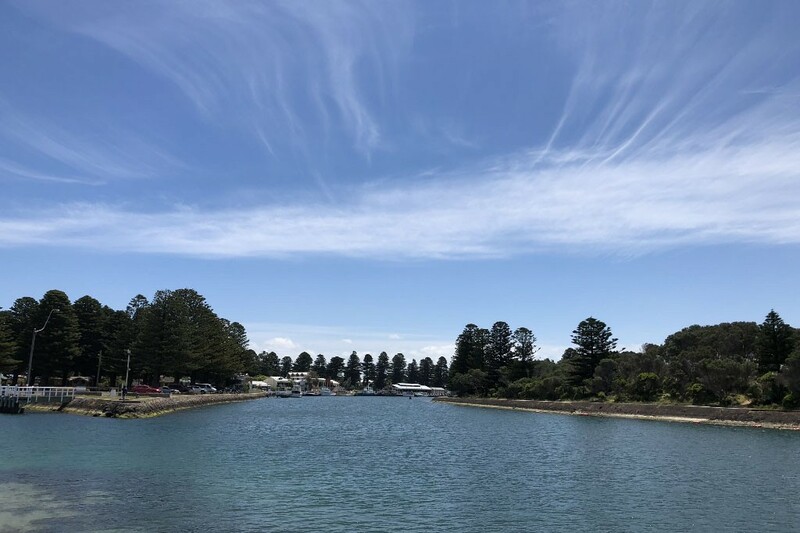 Walking around Port Fairy is easy to do and the most popular walk is from the marina on the Moyne River to Griffiths Island. The colony of shearwater seabirds are fascinating and you finish at the lighthouse located on the eastern tip of the walk. This takes about one hour and is suitable for all abilities. If you are more energetic and love bike riding, the rail trail from Port Fairy to Warrnambool is a great day out. Suitable for families, the ride takes in the township of Koroit and many lovely sights along the way. The different beaches of Port Fairy have something for all ages. The East Beach is fun for body boarding, swimming and beach fishing and the family favourite Pea Soup, is perfect for splashing about in the calm water protected by the reef. Once you have explored the gorgeous town, a visit to the Port Fairy Day Spa is a must. Open 7 days a week, the spa always delivers an amazing massage and experience. When dinner time calls, head to the Merrijig Kitchen located at the Merrijig Inn one of the oldest surviving hotels in Victoria. History abounds in this gorgeous old building and the local food served is absolutely delicious. How to get there: The best way to get there is to drive. It’s an easy drive and there are plenty of small towns to stop at for petrol or snacks along the way. Alternatively, you can get there by bus or train (departing from Southern Cross Station). Perfect for: Families, couples, girls’ weekends. Echuca – and its sister city, Moama – sit right on the Murray River, the third longest navigable river in the world. Founded in the mid-1800s by an ex-convict, Henry Hopwood, the town once had the largest inland port in Australia. While the port no longer functions in its original fashion, Echuca still has the largest fleet of operating paddlesteamers in the world. 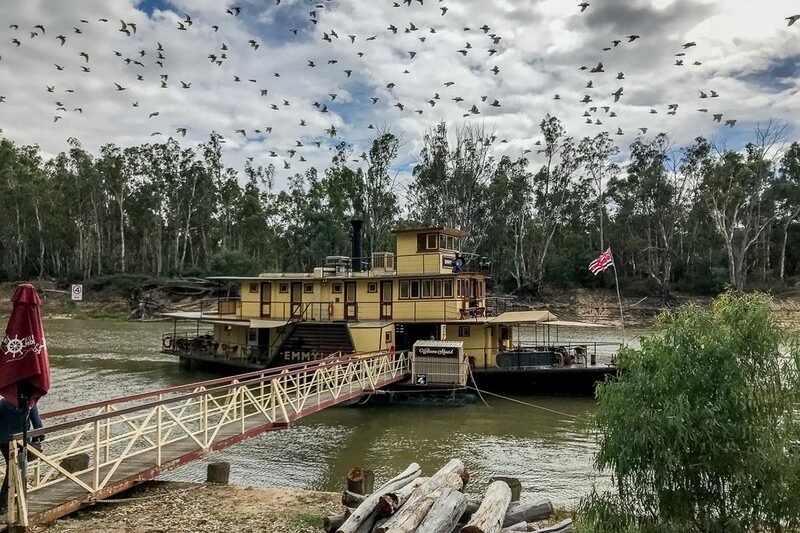 You can’t spend a weekend in Echuca without taking a trip on one of the working paddlesteamers, including the PS Pevensey, which once had a starring role on the Australian classic television miniseries All the Rivers Run. The PS Emmylou takes visitors down the river to Morrisons Winery for a two-course lunch (with a drink included). Afterwards, wander through the vineyards before returning back to town. Learn more about the town’s history with a stroll around the historic Port of Echuca, where you can stop in at a blacksmith or woodwork shop, taste locally made chocolates and wines, or step back in time at Sharp’s Movie House and Penny Arcade. The modern Discovery Centre is a museum to the importance of the town’s shipping trade. During summer, the population of Echuca swells as visitors flock to the town for waterskiing,wakeboarding and camping alongside the river. If you’ve never stood on two skis, there are plenty of companies around town that provide lessons. There’s of course a pub on every corner, but if you’re looking for food that’s more wholesome, The Sweet Meadow’s menu has plenty of veggie-based options. For lodging that’s a little different, you can rent a houseboat and spend the weekend driving yourself down the river. Looking to flush the city air out of your lungs? Falls Creek is one of those magical destinations that isn’t too far for a weekend trip but makes you feel as if you’re completely remote and have escaped it all. So what’s to love? It’s an area of pure nature, where it’s hard to imagine cars and city streets. Sweeping views, lush open spaces, alpine adventures and incredible sunsets. In summer, the cycle routes are incredible, plus hiking trips are endless. All the best walks end with a stunning waterfall as your reward. With so much crystal clear water, you can also rent a boat and sail or take the leisurely route and fish in the sunshine. If the weather turns, there’s an interesting mountain museum to check out, so you’re never short of options. It doesn’t all end with winter either, as Falls Creek transforms into an adventure capital. Ride the ski lifts high into the sky and zoom down smooth slopes. Wondering where you can stay? There are bunk houses for a budget option and hotels and lodges that will suit those looking to spend more. But, if you’re keen for something unique and instagramable, glamping is the way to go. It combines the fun of outdoorsy camping with a few comforts from home. Escape the office and spend the weekend in the mountains – you’ll be glad you did! As you circle back, take a look at these quirky Melbourne dining options. Distance from Melbourne: 1 hour and 10 minutes by car (75 km). Around 2.5 hours by train. How to get there: Car is the best option with easy access to freeways most of the way to the Peninsula. Although it’s possible to get there by train you would need access to a car whilst there to travel around the surrounding area. Perfect for: Everyone. There are loads of activities and sights to see along the Mornington Peninsula that would appeal to the whole family as well as couples and backpackers. The Mornington Peninsula is just over an hour away by car from the centre of Melbourne and no matter where your interests lie, you will find something to do. For all the food and wine lovers you will not be disappointed. Whilst the Mornington Peninsula vineyards are famous you’ll also find craft breweries, cider makers and distilleries. You can choose to fill your picnic basket at a farmgate, book your seat at an elegant restaurant overlooking vineyards or find yourself a casual café. For the kids there are huge maze surfing or tube sliding and strolls along the boardwalks through the wetlands. The Enchanted Adventure Garden is a natural fun park with various mazes and tube slides. A must do in the area is taking a ride on the gondola at the Arthurs Seat Eagle which takes you to the highest point of the Peninsula while taking in breathtaking views from the bay to the city. Let’s not forget all the water activities that come hand in hand with beaches of any kind. From Frankston to Portsea you can swim, dive, fish and paddleboard in the crystal clear waters along the coast. With the abundance of accommodation choices, it’s a place you will want to return to again and again. If you’ve been staying in Melbourne long enough to consider weekend trips outside the bustling city, there’s no better contrast than to visit tiny Raymond Island in the Gippsland Lakes region of Victoria. Though it’s just a few hours away by car, it’s truly a world apart. What’s so special about Raymond Island that justifies a visit there? A few things, but the chief amongst them is the pack of wild koalas inhabiting the island! 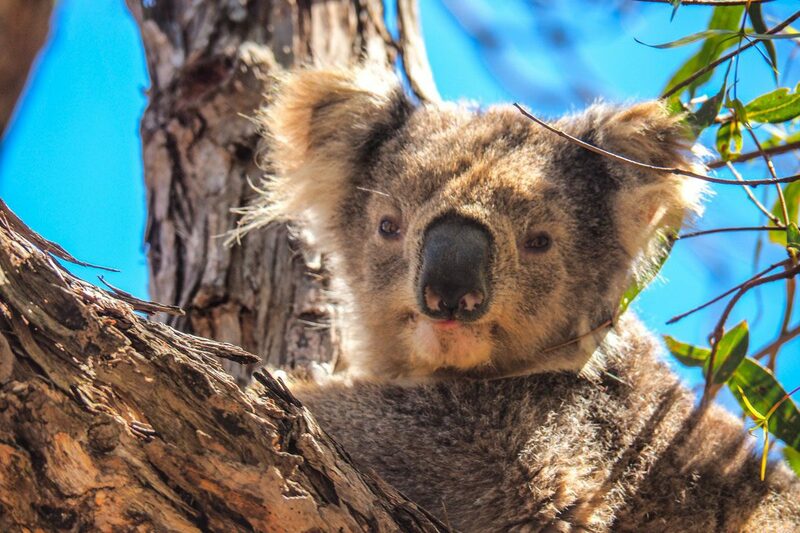 While the koalas aren’t native to the island, they’ve lived there for decades and they’re everywhere. How do you get to Raymond Island? At present, there’s no bridge (though it seems to be a frequent discussion topic). Instead, visitors arrive via a quick chain ferry that can carry pedestrians, bicycles and even a few cars from nearby Paynesville. The great news is that the ferry is free as long as you don’t bring a car! And you definitely won’t need a car on Raymond Island. As soon as you disembark from the brief but lovely ride, just follow the koalas painted on the ground to stroll through the neighborhood and reach the sanctuary near the back of the island. Be sure to look up and down as you stroll – we found plenty of cuddly creatures enjoying neighborhood trees and even a few echidnas casually strolling in gardens! You can easily spend an entire afternoon enjoying the peaceful surroundings of Raymond Island. When you’ve finished, head back to Paynesville on the ferry and enjoy a drink and some lunch at lovely Pier 70 right next to the dock. There are many lovely places to stay throughout the Gippsland Lakes area – whether in Paynesville itself or in nearby towns like Metung or Lakes Entrance. Enjoy your relaxing night and then take in the soft sand of Ninety Mile Beach the following morning before you head back to the city. With ninety miles of pristine coastline, there’s more than enough room for everyone. If you’re feeling more ambitious, consider continuing north to enjoy the rest of the stunning Sapphire Coast road trip. Ok… it’s a little far. But hear me out, Tasmania is well worth the visit. Even if you only have a weekend – although this island deserves much more of your time. Taking the Spirit of Tasmania overnight saves some time and will get you into Devonport for the next morning. You can then enjoy two action-packed days on this island. From Devonport, it’s easy to reach places like Cradle Mountain National Park, the Bay of Fires or Freycient National Park. If you don’t fancy much driving, the northern beaches, including the adorable town of Stanley are also well worth a visit. Tasmania’s an often overlooked Australian state, but it’s one of my favourites for sure. Read more about the island state in my Tasmania itinerary – although you’ll need a bit longer to fit all of this in! 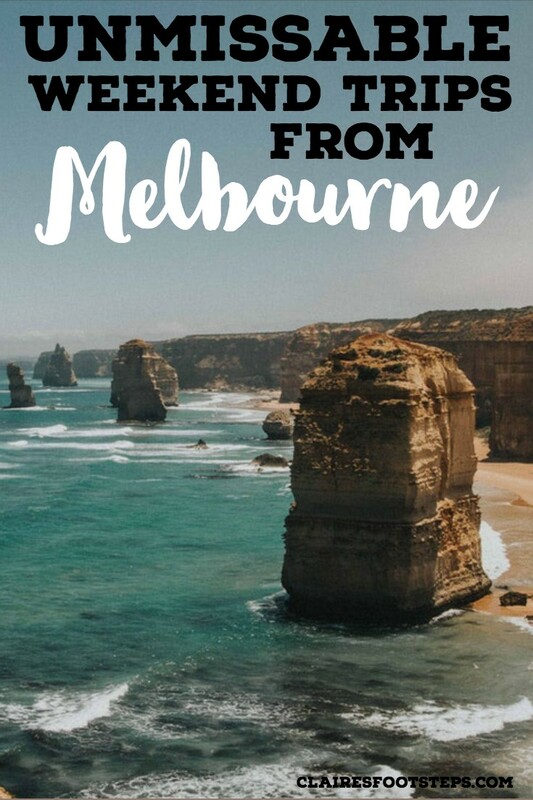 I hope we’ve inspired you to check out some of these fantastic weekend trips from Melbourne! If you liked this post, please share it or follow me on Facebook! If you’re planning a trip to Australia, I’ve got about 100 posts for all over the country. 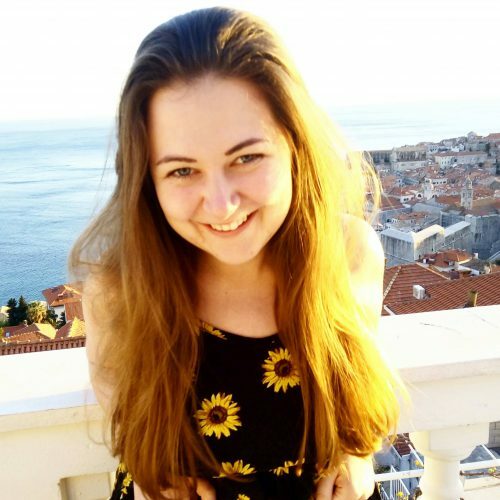 Great round up Claire ! I’ve only done a few of these. We really need to get down that way more often. Hi Claire, that’s indeed a great list. For the Mornington Peninsula, the Bellarine Peninsula, and Bendigo, make sure you check out Winecraft.com that lists all the wineries in each region along with recommended restaurants and things to do!